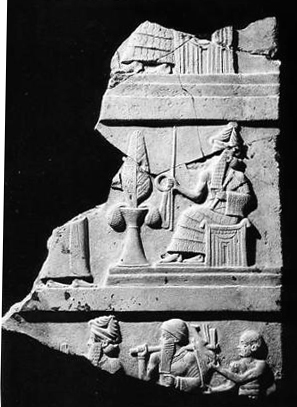 Manual of Oriental Antiquities, including the Architecture, Sculpture, and Industrial Arts of Chaldæ, Assyria, Persia, Syria, Judæ, Phœnician, and Carthage. Ernest Babelon, Librarian of the Department of Medals and Antiques in the Bibliothèque Nationale, Paris. London: H. Grevel and Co. 1906. Chaldæn - "The extensive region of Western Asia to which the Greeks gave the name of Mesopotamia was already, at the period which lies farthest back among the memories of mankind, the centre of a mighty civilization . . . . "
Assyrian - "Besides these sanctuaries erected on the top of staged towers, in which the priests passed the night in watching the courses of the stars, there were other temples . . . . "
Elamite [Discoveries at Suza] - "The ruins of Susa, situated at the north of Ahwaz, form a number of immense tells which cover an extent of four and a half to six square miles on both banks of the river Kerkha . . . "
Hittites - "The name of Hittites [Khatti, Kheta] appears simultaneously in the Bible, the hieroglyphic documents, and the cuneiform texts. It is given to populations of different origin who inhabited Syria from the Euphrates to the borders of Egypt, and also Cappadocia and the greater part of Asia Minor from the mountains of Armenia to the banks of the Halys and the Hermus . . . . "
Phœnician & Cypriot - "The Phœnicians, established on the coast of northern Syria, were not simply the agents of commerce; they also carried the art of the great Asiatic civilizations to all the coasts upon which they set up their factories, and among all the races with whom they formed relations of business . . . . "
Artamonov, M.I. The Splendor of Scythian Art, Treasures from Scythian Tombs, with an introduction by Tamara Talbot Rice. New Ork: Frederick A. Praeger, Publishers. 1969. Prehistoric Thera: Akrotiri - Excavations at Thera Vi. [1972 Season]. By Spyridon Marinatos, Prof. of Arch., EM., Uiversity of Athens. Athens. 1974. With 6 Figures in the Text, 112 Plates in Black and White, and 11 Colour Plates with 7 Maps in Spearate Pocket. Athens. 1974. Isthmia. Broneer, Oscar. "Topography and Architecture." Vol II. Isthmia, Excavations by the University of Chicago under the Auspices of The American School of Classical Studies at Athens. Princeton, New Jersey: American School of Classical Studies at Athens. 1973. Evans, Sir Arthur. The Palace of Minos. A Comparative Account of the Successive Stages of the Early Cretan Civilization as Illustrated by the Discoveries. Vol. II: Part II. Town-Houses in Knossos of the New Era and Restored West Palace Section, with its State Approach. New York: Biblo and Tannen:. 1964. Hauser, Arnold. "Crete" - in The Social History of Art. Vol. 1. New York: Vintage Books/Random House. 1951. Doumas, Christos, Prof. of Archaeology at the Univ. of Athens, Director of Excavations at Akrotiri. Santorini, A Guide to the Island and Its Archaeological Treasures. Athens: Ekdotike Athenon S.A. 1995. Minoan Art. Walberg, Gisela. Tradition and Innovation. Essays in Minoan Art. Mainz am Rhein: Verlag Philipp Von Zabern. 1986. Welch, Stuart Cary. Imperial Mughal Painting. New York: George Braziller. 1978. De Silva, Anil and photographs by Dominque Darbois. The Art of Chinese Landscape Painting in the Caves of Tun-Huang. New York: Crown Publishers, Inc. 1964. This image comes from Silk Road Trade Routes - The Silk Road Seattle Virtual Art Exhibit [Project Director: Professor Daniel C. Waugh, University of Washington, USA. Design by Lance Jenott. Silk Road Seattle - "An ongoing public education project using the "Silk Road" theme to explore cultural interaction across Eurasia from the beginning of the Common Era (A. D.) to the Seventeenth Century."